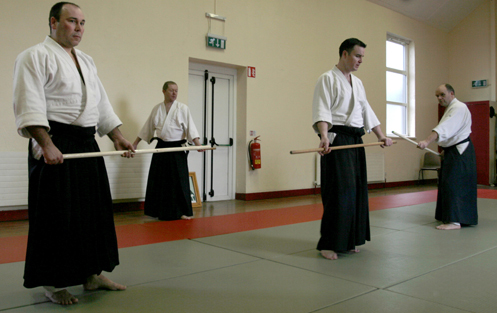 The Aikikai Ireland calendar for 2013 is looking good with plenty of Aikido action. 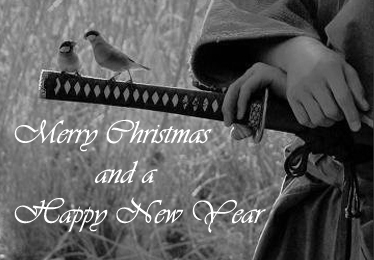 Look foward to seeing you all in the New Year folks and thanks to all involved who made 2012 such a memorable one for all at Aikikai Ireland!!! A great showing of technical improvement by all candidates, keep up the good work folks. 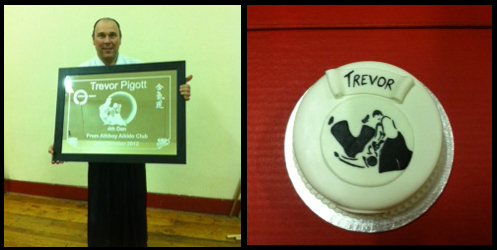 Picture from the course can be seen by clicking the link below..
Pictured above is Trevor Pigott Sensei after a very thoughtful presentation by his students in Athboy Aikido Club of a beautiful specially commissioned mirror marking Trevor’s recent promotion to Yondan. There was a nice cake too which Trevor took home himself and had with a mug of tea, he didn’t even share it with the others (only joking). Well done folks it meant an awful lot to Trevor!!! Newly promoted Dan grades gets attention in local media!!! 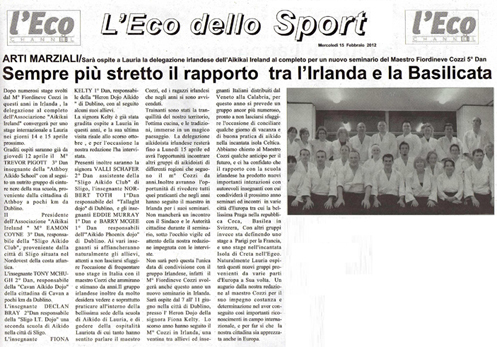 The local the media in the Northwest of the country have given extensive coverage of the recent Aikikai Ireland Dan promotions. 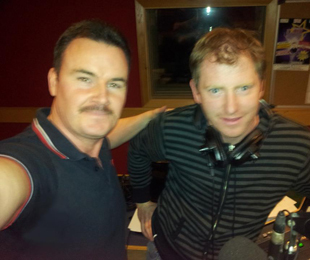 The Sligo Weekenders (sligoweekender.ie) Liam Maloney gave a full page article, Darragh Cox sports presenter on North West radio station Ocean FM (oceanfm.ie) asked Eamon Coyne in to give a live interview on air (click for podcast), also Leo Grey of the Sligo Champion (sligochampion.ie) published an article too. At the invitation of Joseph Kennedy of Kilkenny Budo Club Joe McHugh Sensei of Aikido Ikeda Dojo Wicklow gave a weekend seminar. Classes were conducted on the Saturday evening and Sunday morning with all of the particpating candidates enjoying the seminar with Joe. Grading Pictures from the course in Wicklow now up click pic below!!! Well done to Ryan Smyth on Gold Medal in London!!! and Sligo Jiu Jistu club. Ryan took Gold in 64kg purple belt division However, Ryan won the final after only 1m 29s by applying a cross collar choke to his Norwegian opponent Jomel Engtroe, forcing the tap-out (submission). Humble in victory, Smyth helped his opponent to his feet and consoled him on his loss. 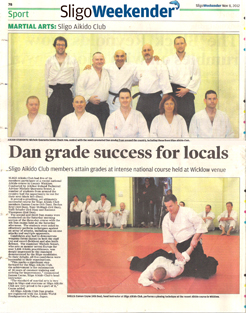 Well done from all in Sligo Aikido Club and Aikikai Ireland Ryan wishing you and the lads in Sligo Jiu Jitsu continued success. Sligo Aikido Club student and kids class assistant instructor Dean Clancy has taken 2 Golds (65kg Senior Men and 70kg Points Karate) and 1 Silver (70kg traditional Karate) at the WTKA World Championships in Marina di Carrara, Italy. Well done to Dean and the Green Dragon Club contingent that travelled to the tournament and done very well!!! What a fantastic course in Wicklow with Michele Quaranta Sensei. At the course Dan grading sessions were held on the Saturday morning and afternoon. Thanks to Joe McHugh for hosting the course in the wonderful area of Roundwood/Moneystown in Wicklow and also to Michele Sensei for the great training. 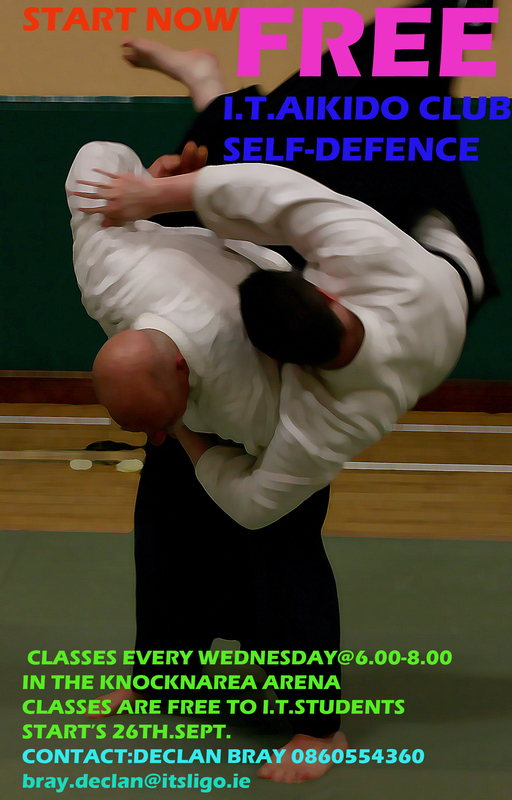 Just to remind people that Aikido classes have resumed in the IT since Wednesday the 24th September 2012. 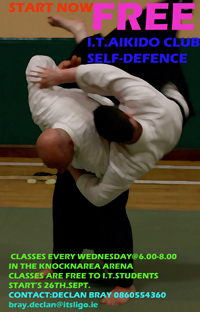 Classes are taught by Declan Bray 2nd Dan Aikikai. Declan has been teaching the students class in the IT for a number of years and has been quiet successful in keeping the numbers high all year round, which is no easy task considering the distractions that students have when they hit college for the first time 8). 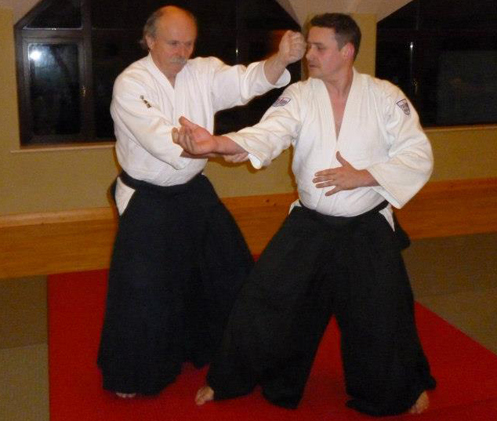 Declan Sensei is looking forward to seeing the regular IT Aikidoka as well as new ones in the coming academic year. The poster can be downloaded by clicking the image on the left. Further details can be found on the IT Club page by clicking on the link below. Courtsey of Ryan Smith of the Sligo Jiu Jitsu club pictures are now up from the cross training seminar to help young Órán Nibbs, you can view them by clicking the link below. Cross training seminar to help young boy a great success!!! On Sunday the 5th of August, Sligo Aikido Club, Sligo Higashi Karate and Sligo Brazilian Jiu Jitsu participated in a cross training martial arts seminar in aid of 3 year old boy Órán Nibbs who suffers from Mitochondrial Disease, a rare progressive genetic disorder (http://www.helporan.com/mitochondrial-disease.html ). The course was a great success with students from all the clubs enjoying the chance to train together and make new friends all in a good cause. The first session was given by Eamon Coyne of the Sligo Aikido Club with Declan Bray and all the Sligo Aikido gang helping out during the Aikido class. The second session was Jiu Jitsu and was given given by Ryan Smyth and Micky Downes, with Morgan Smyth, Francie Mahon, Michael Clancy and the rest of the Jiu Jitsu/Karate gang helping out during this class. Everyone in attendance really enjoyed the chance to learn new things from each other with this unique event. An amazing €1000.00 was raised on the day. A massive thanks to all who attended and donated to help Órán. It proves when good people get together great things can happen. Pictures from the recent enjoyable course with Joe McHugh Sensei in Athboy are now up and can be found by clicking the link below. Thanks to Joe for the classes, to the host dojo Athboy (Trevor and all the gang) and last but not least those that attended the course. Fiordineve Sensei's trip to Dublin in June has been reported on in the Eco di Basilicata ( a newspaper for three counties in southern Italy), as well as an account of his other activities during the year, in Italy.Heron dojo instructor and course host Fiona Kelty has kindly translated the article. You can see it by clicking the link below. A great one days training was had recently in Sligo, at the end of the course eligible students were given the chance to grade. You can see the lads above who graded in the pic above, "the calm before the storm"...A big well done to the following successful candidates.. Photos courtesy of Sarah Conlon they were moving that fast at the course Sarah couldn't get them in focus...;). Click link below for photos. 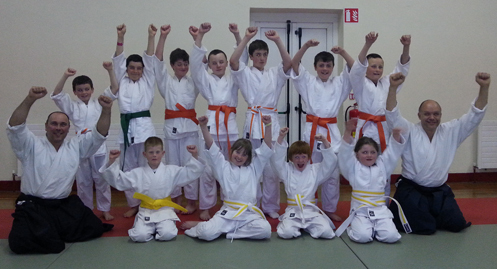 A big well done to kids in Athboy dojo that passed their gradings! Heron Dojo played host to the recent enjoyable Bokken and Jo seminar with Fiordineve Cozzi Sensei. Another great weekends training was had by all in attendance, thank you Fiordineve Sensei for making the trip and of course the lovely Rosella it was pleasure to train and spend time with you once again. Well done to Heron Dojo instructor Fiona Kelty for organising the course and for some great entertainment on the Saturday night. For some shots of the course please click the link below. 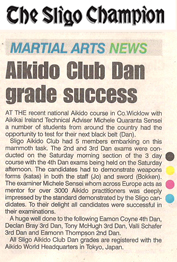 Aikikai Ireland turned the big "3" on the 2nd of June 2012!!!. We can reflect on another fantastic year for all at Aikikai Ireland. We have had the pleasure once again of hosting courses with Michele Quaranta Sensei Aikikai Ireland Technical Adviser, Fiordineve Cozzi Sensei. We had the hard work as always from all the Aikikai Ireland dojo instructors Joe McHugh, Trevor Pigott, Eamon Coyne, Declan Bray, Tony McHugh,Valli Schafer, Fiona Kelty, Eddie Murray, Barry McGee, Norbert Toth, Will Baker, Pj Kirke. We had more progression up the ranks from the most important people to the organisation i.e. 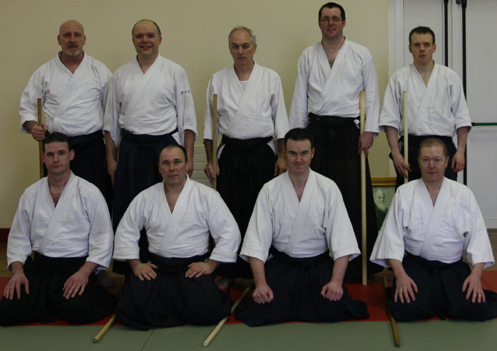 the students both adult and kids in all of the Aikikai Ireland dojos. A new dojo opened for both adults and kids under Joe McHugh Sensei in Wicklow which is going very well. In Sligo in addition to the adults class, Eamon Coyne Sensei started a kids class recently which has started very strongly. 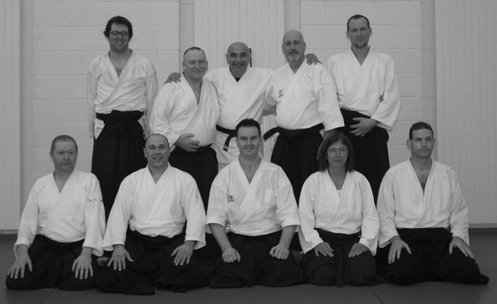 How can we reflect on the year without mentioning the infamous Lauria trip by the Aikikai Ireland gang 8). Thank you Michele Quaranta Sensei for a great course!!! Aikikai Ireland Technical Adviser Michele Quaranta 6th Dan Aikikai once again gave a thoroughly enjoyable course in Athboy, Co.Meath. Students that attended were once again gob smacked at that the vast array of technical skill and knowledge displayed by Michele Sensei. Just want to say thank you also to all the students that attended from the various dojos. And a special mention to all the crew that travelled from the Dublin Aikikai dojos. It was great to train with some old friends and make some new ones. Hope to see you on the mats soon. As promised folks please click the link below to see the pictures courtesy of Declan Bray Sensei IT Sligo taken in Lauria, I have added the photos in the order of the trip from start to finish, enjoy folks. thanks Declan. 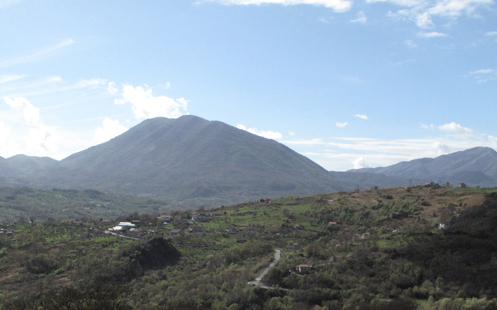 Fantastic Time had by all in Lauria!!! The Aikikai Ireland delegation have returned from a wonderful trip to Lauria for the Aikido Seminar with Fiordineve Cozzi Sensei. The group were looked after unbelievably well by Fiordineve Sensei and his wonderful wife Rosella and all the Italian students. The group enjoyed fantastic training in Fiordineve's breathtaking dojo, treated to the local gastronomic delights and not forgetting the wine!!!! The trip were also welcomed by the Vice Mayor of Lauria Rosario Sarubbi and given many gifts relating to Lauria. The group were also welcomed by Regional Councillor of the Basilicata Dr. Mariano Pici, who paid homage to the Irish guests and the school of Aikido Lauria with two flags symbolising the Basilicata Region to mark the occassion being presented to Fiordineve Cozzi Sensei and Aikikai Ireland Chairperson Eamon Coyne Sensei. 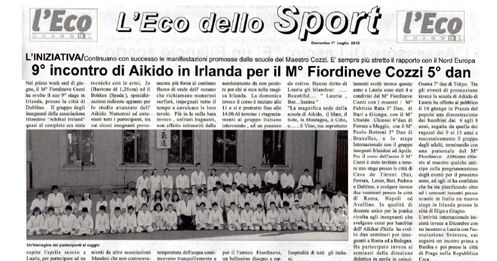 a brief interview with Fiordineve Cozzi Sensei and all the Aikikai Ireland gang see video highlight on opposite page and also source of video here (www.ecodibasilicata.it). a course celebrating Minegishi Sensei's 40th year in Aikido. 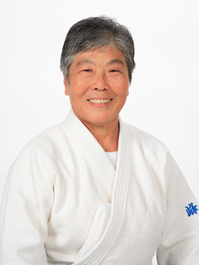 Minegishi Sensei is an example for all Aikidoka around the world, standing at 5 feet 1" over 70 years of age her Aikido is dynamic and fast with energetic movements and she has an enthusiatic teaching style.Her fluency in English enables her to give clear explanation about every detail about Aikido. We have had the privilege to train with Minegishi Sensei at a previous AOI course before. To see the letter that Minegishi Sensei sent to Fiona and also relevant information please click the link below. Also included is Minegeshi Sensei's intenerary for Europe in April and May which Minegishi Sensei has also invited us to. We were saddened to hear the news that Yoji Fujimoto Sensei has passed away this morning (Feb 20th). Our sincere condolences go out to his family and his students. 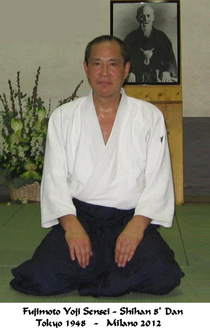 Yoji Fujimoto Shihan was born in Yamaguchi (Japan) on 26th March 1948. Since his childhood he was initiated into the way of the martial arts by his father, an 8th Dan in Kendo.Fujimoto Sr. was instructor at the Kendo Dojo of the local Police. The young Fujimoto picked up Kendo and helped his father in the Dojo. 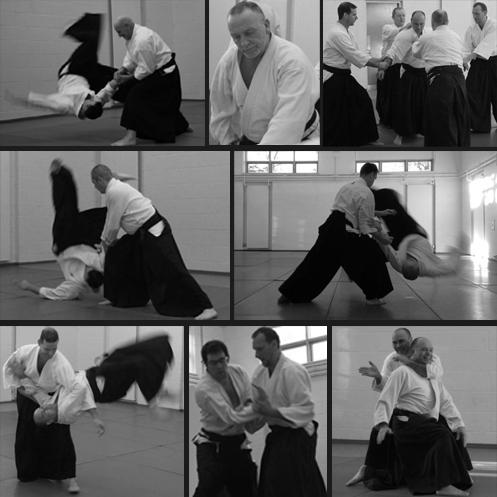 One day he went to assist at an Aikido class at the Aikikai Hombu Dojo and was stunned by what he saw. 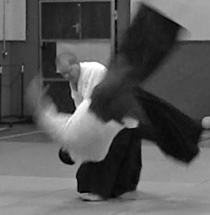 A few days after he enrolled and started training in Aikido. Promoted Shodan at about 14 years of age, at 21(1969) he was already Sandan. Fujimoto Sensei moved to Italy in 1970 to help Tada Sensei in his efforts to bring Aikido to Italy. 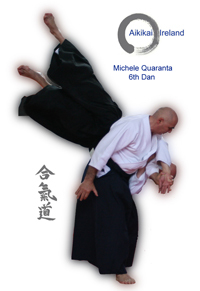 He based himself in Milan and contributed to the development of the Italian Aikikai. In recognition of his efforts he was promoted to 7th Dan in 1994 and 8th Dan in 2010. Anyone who has had the pleasure to train with Fujimoto Sensei will testify to what a great Sensei he was and what beautiful elegant Aikido he produced. Your Aikido will live on forever through your students. 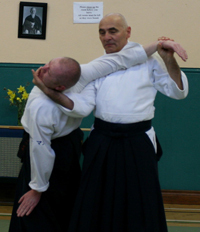 On Friday 10th through Sunday 12th of February Aikikai Ireland Technical Adviser Michele Quaranta Sensei 6th Dan gave a thoroughly enjoyable course in Sligo. Over the weekend again Michele Sensei covered a mulititude of material. 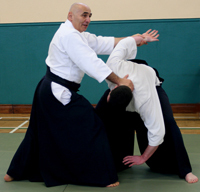 Again it never ceases to amaze all at Aikikai Ireland of the depth and vastness of Michele Senseis knowledge.This was amply demonstrated during the classes over the weekend. The invite from Fiordineve Cozzi Sensei for the Aikikai Ireland gamg to come to his beautiful dojo in Lauria has been in the pipe line for a number of years. 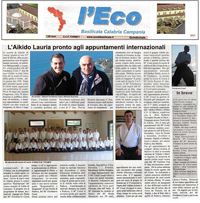 This will come to happen this April, the "Eco di Basilicata" newspaper in Italy has an article announcing the visit, you can check the translation of the article by Fiordineve Cozzi Sensei by clicking the link below. On Saturday 21st of January a small group of the Aikikai Ireland Yudansha got together in the Athboy dojo to get some serious training done. The morning class consisted of Jo work and the second class the focus was on the Bokken. Thanks for a great days training lads....well done. Look forward to the next one. 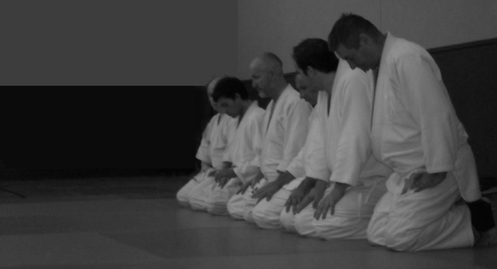 On Monday 9th of January Aikido Ikeda Dojo Wicklow opened under the instruction of Joe McHugh Sensei. Joe would like to extend a very special thanks to the following people who attended the opening training of the Aikido Ikeda Dojo on Monday 9th January. Ben, Barry, Eddie,Yam, Cillian, Joe, Fintan, Norbert, Daniel, Tony, Jean, Trevor, Willie, P.J. and Ciaran. For photos from the opening night you can see them on the Ikeda Dojo Wicklow website by clicking the link below.